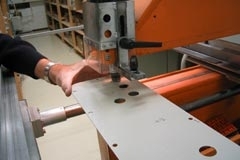 Should unforeseen circumstances oblige you to have your panels assembled elsewhere, then Moekotte is your ideal partner. At any stage of a project, the Moekotte workshop can be used to meet a required lead time or for an economic method of assembling specific panels, even if the materials have already been ordered and are supplied by you. All of these services are of course provided within the terms of the requested quality standards and with the right project support, to ensure that the corresponding administrative information, including test reports, audit forms and revised drawings for example, is also in order.